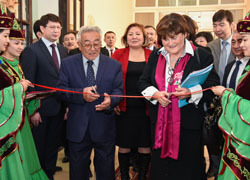 Regional Director Dr Zsuzsanna Jakab and President of the Kazakh Academy of Nutrition Prof Torgeldy Sharmanov inaugurate the new centre of excellence. WHO officially inaugurated a new centre for excellence in primary health care in Almaty, Kazakhstan, on 11 February 2015. The centre will ensure that WHO/Europe is well equipped to support countries in revitalizing primary health care. Dr Zsuzsanna Jakab, WHO Regional Director for Europe, and Dr Salidat Kairbekova, First Vice-Minister of Health and Social Development of the Republic of Kazakhstan, took part in the opening ceremony. Dr Jakab thanked the Government of Kazakhstan for its global commitment to the primary-health-care approach, as well as undertaking reforms in the country. Kazakhstan has a long history of promoting primary health care, dating back to the Declaration of Alma-Ata in 1978, which called for urgent national and international action to protect and promote the health of all. build synergies with global health initiatives, foster partnerships with leading academic institutions and think-tanks, and work with development partners. participation in a senior policy seminar on transforming health-service delivery in Kazakhstan, focusing on key developments in primary health care in 2016–2020. Primary health care is health care received in the community, usually from family doctors, community nurses, staff in local clinics or other health professionals. It should be universally accessible to individuals and families by means acceptable to them, with their full participation and at a cost that the community and country can afford.